Maybe the US Dollar Index “correction” is over. 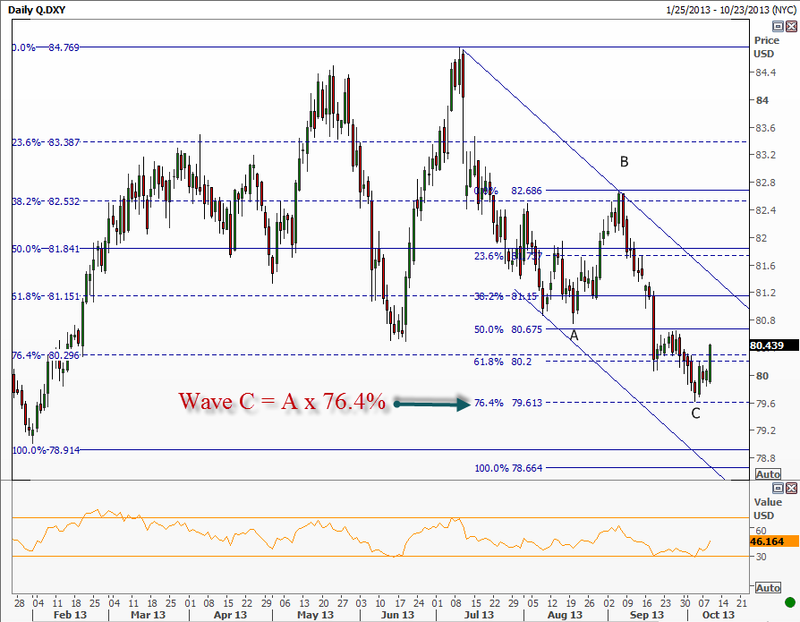 Using a simple A-B-C count of the legs, or waves, down in the US dollar index shows the last leg, or C-wave in this chart, found support right at a key exetnsion level, i.e. wave C = 76.4% of wave A. I know for those who aren’t into this stuff, it sounds a bit like mumbo jumbo—and it may be. But there we have it. And today’s rally in USD on the back of news that President Obama chose Janet Yellen as his candidate to replace Hellicopter Ben makes the rally even more interesting given the consensus view that Janet will make Ben look like a monetary hawk. …it’s that sentiment thing I guess. I posted an update to our fore service Track Record . You can find that on the home page. Though clobbered pretty hard in July, August, and September, we are getting back on track and still up about 37.8% year-to-date.